I found this at the Grande Bibliothèque here. It's actually a different double reprint of two of Holding's books (back-to-back so you flip the book over to read the second book). 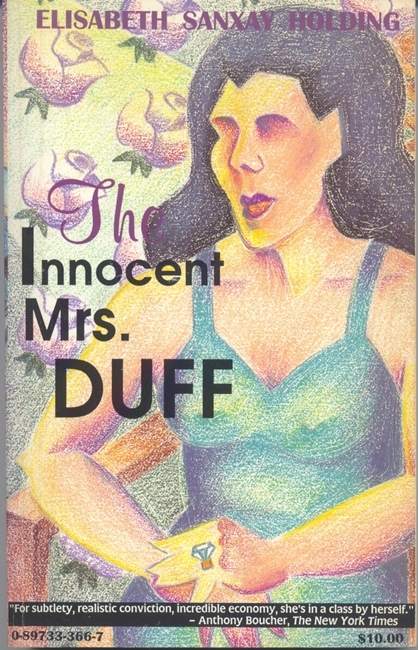 The Innocent Mrs. Duff is from 1947, which would be a bit later in her career (though she wrote 4 books after it before dying in 1955). I have to say that either I didn't get this book or that it is not one of her better efforts. It did help me to identify some recurring themes in her work. 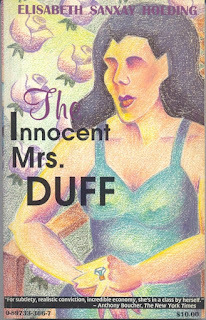 The story is about Jacob Duff, a wealthy New Yorker out in the suburbs. His wife had died and he recently remarried a younger model. They have been married for a year when the book starts and he is already clearly exasperated by her. His distaste is all centered around class, somehow she can't do anything right, though she seems honestly to be making an effort. He also is struggling with alchoholism, though in total denial about it. As the book goes on, you realize he is an absolute drunk and that his life is spiralling out of control. However, right from the beginning, I couldn't get a handle on his character. His alcoholism accelerates so quickly. I couldn't tell if it was him being an unreliable narrator or just that was the way Holding thought alcoholism works (which doesn't seem likely as the rest of portrayal is quite accurate). It threw me. Furthermore, the guy is just completely stupid, almost addled to the point where you wonder if he is being drugged by someone else. Basically, he just gets more and more confused and paranoid and ruins his life. There is some hinting at a mystery but there really isn't one in the end. The narrative does careen forward and is entertaining and almost funny. At one point he goes to the office to try and type up a fake ransom letter. The secretary wants to do it for him but he can't let her see what he is typing. He sits at the typewriter and keeps screwing it up and then stuffing the erroneous pages in his pocket, all the while the secretary is standing there waiting for her typewriter. An odd story, kind of fun, but ultimately left me a bit puzzled as to what story she was trying to tell. The late, great Ed Gorman writes a much more positive (and better) review that does make me realize this book is very well regarded by those whose opinions on these things count (Raymond Chandler said it was the best book about alcoholism). He paticularily appreciated the portrayal from the drunk's perspective and the constant sense of dread that forces you to turn the pages. I can attest that these things are very good in the book. I just felt unsure of the foundation I was on from the beginning.